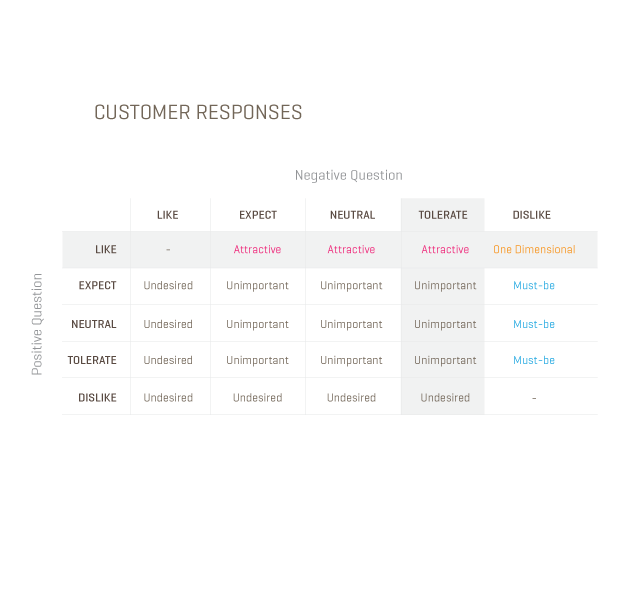 Those emotional responses are a part of a Kano model graph. 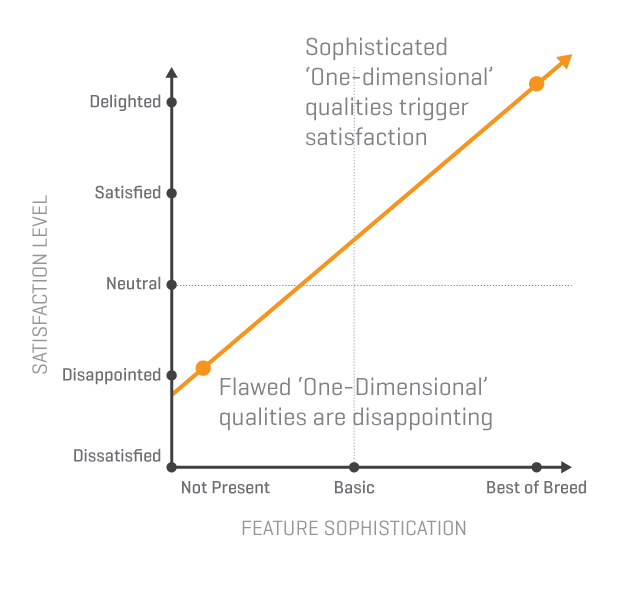 They make the y-axis and the x-axis represents sophistication of a feature in your product. Feature types represented on a graph by curve lines. Pretty self-explanatory. 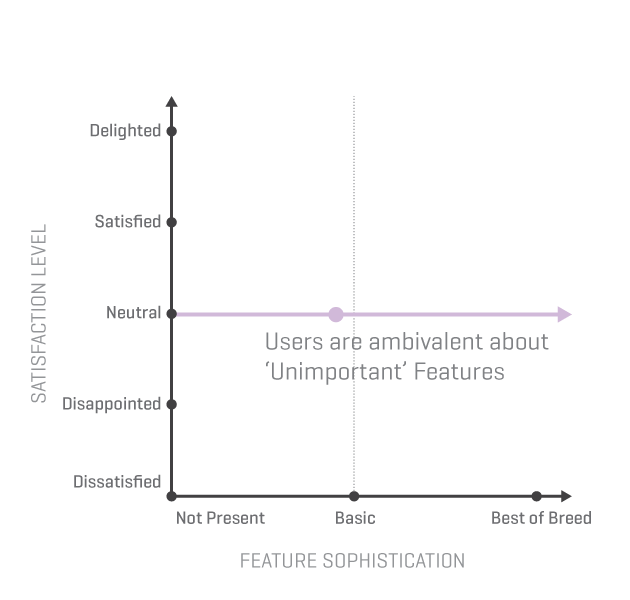 Without those features, your product will not be adopted. Your customers expect those features. More of "must-haves" do not equal more satisfaction. Customers simply do not care for those. Include it or not does not really influence satisfaction level. If those present - it satisfies customers. If those absent - it dissatisfies them. The more of those features - the better. 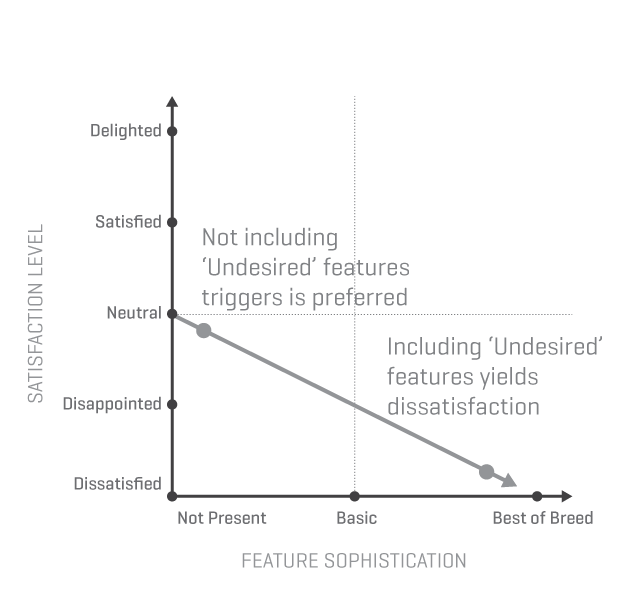 Customers feel satisfied when those features are present, although they do not feel unsatisfied if those features are absent. Because customers do not expect to find those features in your product. It's a surprise, something unexpected. Maybe they even didn't realize they need those features. Those are neglecting the effect of Attractive and One-dimensional features. Not including them would not affect satisfaction level, but if those are present it may trigger dissatisfaction. Your product and your market are constantly evolving. So as features and customer perception of them. What was an attractive feature yesterday is a one-dimensional today and will be a "must-have" tomorrow. 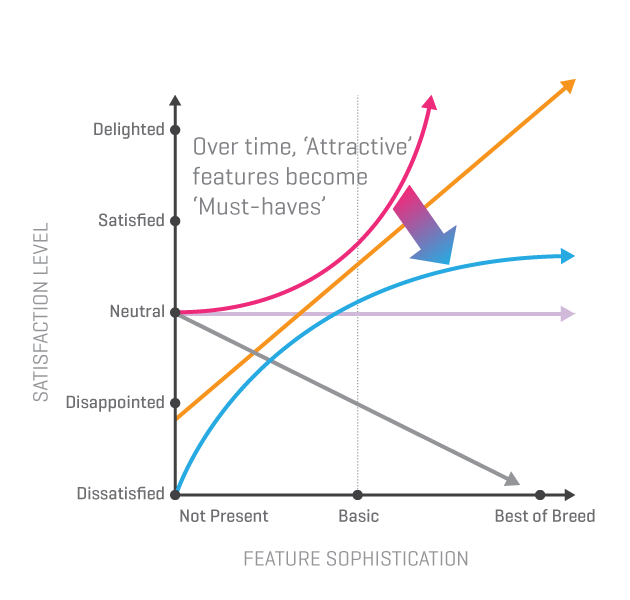 Therefore you need to regularly update your Kano model to spot the moment when a feature changes type. 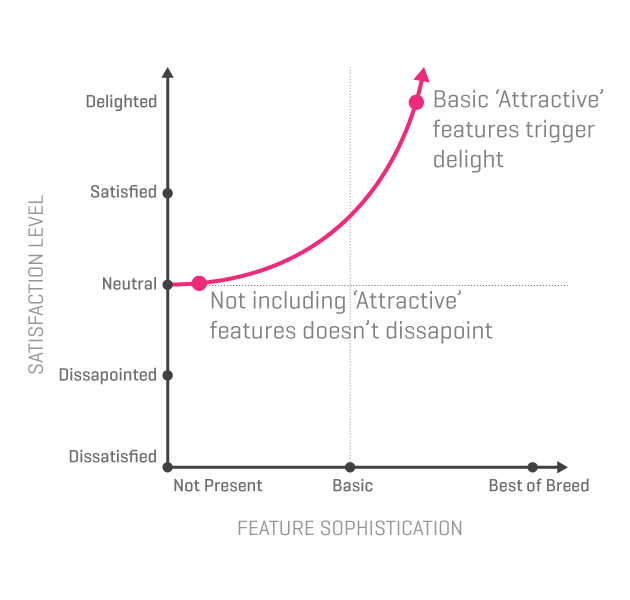 Such paired approach is the key to building a Kano model. - What if "feature 1" was present in the product? - What if "feature 1" was NOT present in the product? - I dislike it to not be present. This describes a "must-have" feature. Responses you are going to receive by asking the paired questions you then need to analyze using the table below. It will allow you to classify feature types. Horizontal rows represent answers to a positive question, while vertical columns represent answers to a negative question. Intersection represents category type of the feature in question. My favorite example to illustrate the Kano model is a hypothetical hotel. Imagine that your product is a new hotel. You're about to start building it and currently conducting a study to fill out your Kano table. - Dear customer, thank you so much for your eagerness to answer my questions. Let me start with the following one: would you expect a hot water to be present in your hotel room? - What a silly question that is? Surely, I would expect hot water to be available. - And how would you feel if it will not be present? - In such case, I will not stay in your hotel and make sure that all my friends would know about it and would avoid your place. - Thanks a lot for your honest answer. And how would you feel if we will paint our walls to nice, ambient color? - I guess, I would not mind. - And if it will not be painted this way? - Look, I don't really care about the color of the walls. - Great. What about room space? - Yeah, I'd like more space in a room. - And if it's not? - It would bother me, but I can live with that if it's comfortable. Yet more space would make me more comfortable. - What if during check in you will receive our exclusive, freshly baked, complementary cookie. How will this make you feel? - I like it. That's what I get nowadays in all good hotels. I remember when they did it the first time - it was really nice gestures. Now that is a given. - So if you'll not receive a cookie? - It would not bother me. - Final question: what if we can iron your shirt for you? You leave it in the evening and we deliver it to your door the next morning, perfectly ironed. That's all for free. - That would be... really cool. My shirts are always getting wrinkled in the suitcase. If that would be an overnight, free service - that would really be a differentiation. - If that service will not be present? - I will not notice, will I? You just told me about it, I would not expect it otherwise. - Thank you so much, here is your cookie. 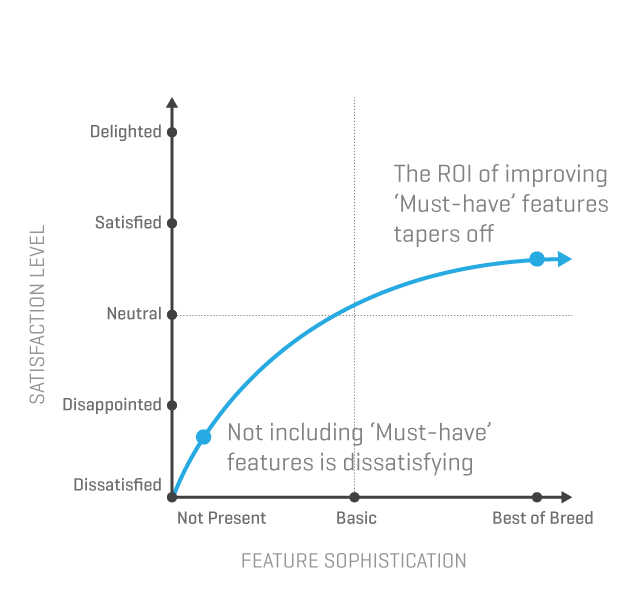 When you don't know what features to include in your product or what features your customers will appreciate the most - use Kano model analysis. This structured approach will help you to conduct a research and find out on which features you need to focus on.